The Dead Bird by Jean-Louis Greuze, Part 9 of the Introduction to Art and Artists of Our Time. "The Dead Bird" was one of the notable pictures in the salon of 1759: a repetition of it was sent to the exhibition of 1765, and was made the subject of one of Diderot's most striking criticisms. It begins in his lyrical manner: "The pretty elegy! The charming poem. What a lovely idyl Gesner would have made of it! It would serve as a vignette to one of his poems! Delicious picture! The most agreeable, and perhaps the most interesting of all in the Salon. The poor child faces us: her head is supported by her left hand. The dead bird lies upon the top of the cage: his head hangs down, his wings are dragging, his little feet are in the air. What a pretty bier the cage makes! What a graceful garland is this bit of green that is twined about it! The poor little girl, alas, how sorry she is! How naturally she is posed! What a lovely head she has! How charmingly her hair is arranged! How expressive her face! Her grief is deep: her misfortune absorbs her: she is entirely wrapped up in it. Oh, what a beautiful hand she has! A beautiful hand! A beautiful arm! How true are all these details - these fingers, these dimples, this softness, this slight redness of the finger-tips, where her head has pressed upon them - and the charm that pervades the whole picture! We feel that we could lean down upon this hand and kiss it, if it were not for the respect we feel for the child's grief. Everything about her is enchanting, even to the arrangement of her dress. Her kerchief is thrown about her neck, such a way! It is so light and gauzy! When you first catch sight of this picture you say to yourself 'Delicious!' If you stop to look at it, or if you return to it, you exclaim 'Delicious! Delicious!' Soon you find yourself conversing with this child and trying to console her. This is so true that here are the very words I remember using---"
This was Diderot's manner of approaching his point. He knows very well the precise value of Greuze's picture, but he was personally fond of the artist, and he knew that a good dose of flattery would make the conclusion of his criticism more endurable. For diderot saw beneath the surface of his friend's pictures, saw their pretence, their insincerity, their double meaning, and laughed at them, at first in his sleeve, and in the end aloud. 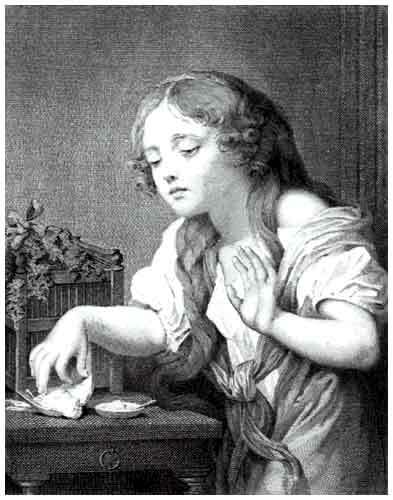 In his playful, imaginary chat with the girl, he goes from step to step until at length she has confessed to a lover, has confessed that she is not crying wholly for the bird her lover gave her, and which died from her neglect while she was absorbed in grief for his desertion - "So much grief," says Diderot, "at her age! And for a bird! - But, after all, how old is she really? What a question you have asked me, and how shall I answer you? She has the head of a girl of fifteen or sixteen; her arm and her hand are those of eighteen or nineteen. This is a fault in the composition, and it is all the more evident, because by the attitude he has chosen, the artist has brought the head and the hand close together, and thus made one the measure of the other. Had they been separated we might not have perceived that the hand is too large and too strongly marked for the head. It is evident that the head has been drawn from one model, and the hand from another." The "Father reading the Bible to his Family" was Greuze's earliest picture, and it has all his faults of conception and execution in full measure. Here not only are all the people melting away, but the chairs and tables are melting with them in sympathy. The conception of the picture is purely sentimental and unreal; to use an expression that savors a little of vulgarity - it is all gush. The emotion of this family is in excess. They seem completely overcome by their feelings. One would think they had never heard the Bible read before to-day. The mother is down upon the floor, with her elbow on the table; her daughter is beside her on her knees; the eldest son, his clothes falling off him, his three-cornered hat stuck on the back of his head, stands staring at his father with the look of a man who has been on a spree. Greuze always gives his people large families; it was a trait of the sentimentalism of the times; immensely effusive about marriage and offspring, and the beauty of mothers nursing their own babies; and, so, in all Greuze's pictures, the children are thrown in with an unsparing hand. Here, beside the elder ones, there are two behind the father's chair, and a little one squeezed in between the mother and her daughter, while in the foreground the old grandmother pauses in her spinning to quiet another little one who is teasing the dog. It is this flabbiness of the moral sentiment, the popular perception of a want of truthfulness, of manly feeling, answering to the lack of technical qualities, that have gradually done away with Greuze's reputation as a painter of such subjects as these. His heads of children and young girls are still admired, and there are several fine examples of them in this country. But it must be confessed that even in these heads meant for virginal, there is a want of the charm, the freshness, the innocence of girlhood. At the best they are vapid in expression and without distinction, as may be seen by the one of which we give a steel engraving, having nothing to recommend them but a certain sensuous charm. The life of Greuze is in striking contrast with the lives of Boucher and Fragonard. His house was desolated by the bad conduct of his abandoned wife, and it may be doubted whether he set her any too good an example. Still it tells much for him, that with all his foibles, his ill-temper and his excessive vanity, he was an industrious and hard-working man, one who was very far from hiding his talent in a napkin. By his paintings and his engravings he earned a great deal of money, especially by the latter; his subjects were popular, they suited the emasculated taste of the time; the very qualities that repel us made them attractive, not merely to the Paris, but to the France, and even to the England of Greuze's day. We can imagine the age of "Pamela" and "Clarissa Harlowe," of "Faublas" and "Manon Lescaut," and "La Nouvelle Heloise," and the "Confessions," enjoying Greuze's moralities and sentimentalities; however disguised, they are of the same greed and appeal to the same tastes. But the Revolution came and Greuze was ruined: his fortune took wings in assignats, his name was forgotten, his work passed away with the change of fashion, and he himself sank into oblivion. He died in 1805, and the man whose engraved works had been admired far and wide, the man whom an emperor had visited and praised, the man whom the fashionable world of his time had adored, was followed to the grave by only two of his friends, Dumont and Berthelemy. One consolation, however, lightened the heavy load of his last years: the ministrations of an affectionate daughter, Anna Greuze, herself a painter, not without some feeble reflection of her father's skill.